Windows 10 when launched for first time it is full of bugs and problems but sure we must say that it has improved drastically over the time and with the anniversary update windows 10 has became the OS worth upgrade for its previous versions .well,now its time for another treat for win 10 users because Microsoft has just released its Creators Update on April 11 and must say that it has some awesome features improved and some new features came with it .Now here are some best features i find most helpful and useful with the update. option where user can choose the time when to install the updates by setting the time when we desire a part from our work hours . well, it used to be 12 hrs for pro edition for the previous update but now it is increased to 18 hrs and it will be a great help. This mode is similar to the application F.lux or the applications in android store . 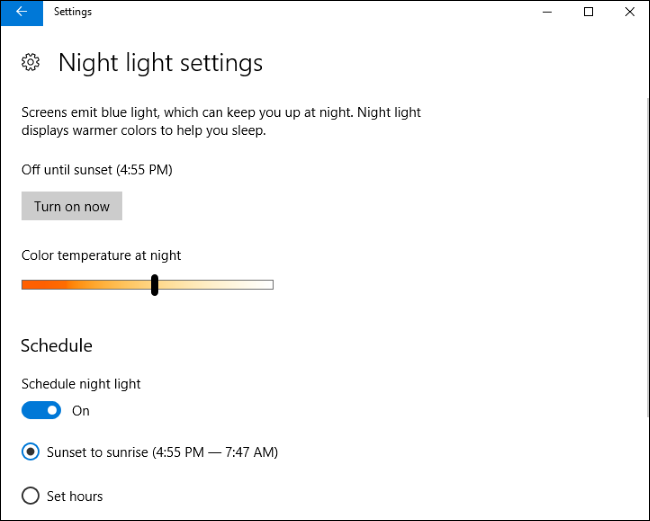 It is available in settings -> Display -> Night Mode. brightness of screen to more efficient for night time use and also reduces the stress on our eyes . For better experience use both F.lux and Night mode so the display can be more vibrant and efficient for night time use . To keep our hard drive space freed up . the options or both while choosing it totally depends on the user. We can also find all the files where they went by using "WinDirStat" application by running in our PC. From creators update we get a new "Gaming " tile in settings portal with X-box logo and lot of these features are already present in previous version but now all these are present under one option and there are lots of options available in it like GameDVR mode ,Game Play Mode ,Game bar .But if you dont plan on using these features disable them as options like "Game DVR " mode which records in the background of game play couls take up lots of resources so we can disable it . it could show some difference. It is like 3D version of MS Paint .It is simple and easy and it has some intalled 3D objects already installed so that we could enhance,change move ,resize and draw on them .It has no practical application for now but is fun to mess with it . The cool thing is if we created any 3D object we can share it and also we can use the objects from others creation. It is know that Microsoft is working on Headsets to implement Mixed Realit portal .It allows us to create virtual 3D environments like if we put on the headset we can see virtual 3D portal with desktop and start menu instead on monitor .it runs in developer mode and now it is only possible to run in a simulator because headsets are not available yet so we could see how this is goig to be in simulator. It is kinda like Holo Lens but with head set and much more promising. After creators update privacy settings are much improved and all those settings come under one room and easily accessible to the user .Windows asks in the beginning itself to go in which mode to be safe .But there is no way to stop sending data to the Microsoft. Here comes some options where troubleshooting can be possible in the system and makes it easy to the user to find the solution or search for better option .It is available in previous version but not beneath the surface it was burried under lots of options and hard to find it. It is similar to that of android .Basically when our PC is connected to Phone through Blue tooth and whenever we move away from PC it automatically locks and unlocks when we come near it .Although it depends on certain distance before locking up on the system. It can be accessed from Settings -> Accounts -> Sign in Options -> Dynamic lock. Windows 10 creators update is not official yet to all the users but can be downloaded using windows updator application buy checking your PC compatibility .